I generally follow guide lines from Laurel's Kitchen Bread Book and Tassahara. I make the sponge ala Tassahara, and shape according to Laurel's desem instructions. I've tried adding two teaspoons of high gluten flour to help with the rise but can't see much effect. I always make free form loaves and the always look like big, thick cookies. Not a nice tall free form loaf. I measure carefully, grind my flour fresh for each two loaves, and according to the instructions with my old 70's era self assembled stone grinder kit, I grind it on the gritty side. They claim this will give better flavor. If not making desem, I use the standard amount of active dry yeast for two loaves. 2 pkgs. I use 1/3 cup of butter or olive oil and 1/4 cup blackstrap molasses as the only sweetener. I used to kneed for the full 20 min. I've been cutting that back to see if it helps. So far it doesn't seem to. I am wondering if I need to start with a stiffer dough. This would be pretty stiff. But would that help it hold it's shape better on that third rise in the 98 or so degree oven? I usually get good rises doing it this way till the one after shaping, the final rise. Don't get much oven spring either . The bread is always pretty good tasting just not much higher than about 3 to 3.5"at the center of the somewhat round loaf. These results are similar to the desem results as well. I bake in a wood fired French Canadian style mud oven. The temp is close to 500 after a soaking period of 15 to 30 min. I erroniously posted this to the general forum so I am repeating it here. Your wheat isn't strong enough: What you want, if you can find it, is hard spring wheat. It'll have the highest protein percentage and will rise the most. If you can't find hard spring, hard winter will do, but you won't get as high a loaf. Grinding finely will also give you a higher loaf, so you might want to see if a finer grain grind helps. You could, indeed, be going too wet:: But I kind of doubt it from what you've said above. I'd recommend going out and buying a bag of high quality whole-wheat flour like King Arthur Flour. I've never had any performance problems from KAF whole wheat flour, and, given its popularity, have never gotten a rancid bag. If you can produce a good loaf with the bagged flour, you should see if you can find another source for wheat berries. Thanks for the help Jmonkey, you and JERSK have given me some good places to make changes. As I told JERSK, I'd been told to get hard red winter. But the spring should be available here in New Mexico. Sadly I just split 50 lbs. of organic red winter wheat berries. Oh well ,maybe the guy I split it with will take more than half of it. I will also change my grind settings I have lots of adjustment in that direction. Do you suggest pastry flour fineness? I appreciate you comments on my other post yesterday. I have nothing against people who use white flour, it's business hacks misleading the comfortably numb with the words whole wheat. I have trouble with those who justify thier use of it saying it's just as nutritious. That's just not so. But yes a diet with plenty of other fiber sources won't suffer much from occasional use of dead flour breads. I enjoy french bread as much as the next guy. Fortunately, I don't come across it much. It's too good. And with things like pasta WW bread is pretty much overkill. I'll try the finer flour before trying less water. It's a pretty stiff dough by about half way thru the kneading time. I was using 20 minutes according to Laurel's recommendations but since I wasn't getting good results I've shortened that by four or five minutes. I'm fairly new to baking. Maybe a year or so but I get this feeling 12 to 15 minutes kneading a 100% whole wheat dough that it's ready. I couldn't tell you why, tho thinking of it now its that the dough gets elastic and stops tearing where I fold it during kneading. How long do you knead you ww bread dough? Thank you again for your help. Another forum member answered this so well awhile back that I'm just going to copy in their post. Submitted by ivrib on November 1, 2007 - 9:08am. 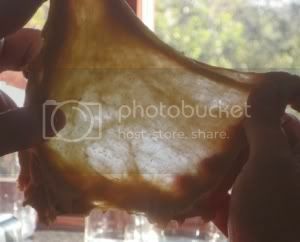 windowpane test: take a small amount of dough and work it by streching and pressing lightly so it gradually thins out. if you can create a thin rather transparent sheet of dough that holds your dough is thoroughly kneaded. poking test: after kneading work your dough into a ball by folding the sides of the dought under the dough from all directions. poke the dough. If it readily spring back it's kneaded enough. collapsing test: after shaping into a ball as described above, press the dough from both sides, with both palms towards the center of the ball then let go. If the dough readily collapses from its flattened state it's ready. Here'a a picture of a windowpane. This is in a 40/60 WW/white flour dough, but you can get a similar one in whole wheat dough. And finally, here's another description of teasing out a windowpane from Mike Avery. To perform the test, pinch off a piece of dough about the size of a golf ball. Roll it between your palms until it is a ball. Then using the fingers of both hands, tease out the dough. As the dough flattens, turn it as you would turn a plate so you are pulling the dough evenly, not just in one place. The dough should be able to stretch so you can see light through it without tearing. If the dough doesn't stretch, it isn't ready, so knead some more. If you just pick up the dough and pull, it WILL tear. You need to gently tease out the dough, not just pull it. Spring or Winter, Winter or Spring? I just spent a fair amount of time looking around looking for protein levels on hard red spring or winter wheat. And I just didn't see that much difference. While SOME hard red spring wheat has a higher protein levels, other strains are lower. Hard red winter wheat seems to be in a narrower range. Which gets to the question - what's in YOUR flour sack? I've been using hard red winter wheat and I've been happy with it. I think that there are other issues in play here that are more critical. On flour selection, you may be better off looking a name brands and trying to stick with them. It's great if you find a bin of kernels at your local health food store that really works for you. But, the people at the health food store neither know nor understand what you're doing with the wheat. So, if they can save a nickel a pound, they'll switch vendors. Knowing that the wheat comes from Wheat Montana or Rocky Mountain Milling or Stafford Mills or Arrowhead Mills or whomever will give you more of an assurance of what's in the bag with regards to baking properties than the label "hard red winter wheat" or "hard red spring wheat". That said, expect variations from season to season. Some years just aren't like other years. Hey Mike, Thanks for the info on the spring vs winter. I was obsessing a little over the fact that I just split 50 lbs of organic hard red winter wheat berries after reading seveal recomendations favoring spring. I don't use much flour that I didn't make myself. I agree with JMonkey that maybe your grind is a .little too course. Also, maybe it just doesn't have enough oomph for 3 rises. I also have a wood fired mud oven. I find it hard to believe that it can reach that temp with only a 15-30 min. soaking. How, did you measure this? It could be that the inner hearth reached that temp. temporarily and than quickly cooled as the outer walls try to reach thermal equilibrium. I fire mine for 4-5 hours and it stays hot for along time. Mine isn't very big, but I have 5-6" thick walls with about that much more insulation. Alan Scott in The Bread Builders determined that a long slow firing or soaking will keep the oven at a higher more stable temperature longer than a faster hotter firing. Of course you have to let it cool for awhile before you can bake bread. I usually make some pizza or roast veggies or something while it's real hot. Thank You JERSK, I appreciate your help. Glad to find another mud lover here. We have a terminology discrepancy in my email. I used the word soak to describe the period of resting [ to let the temps even out a bit] after ashes have been removed but before adding bread or pizza. I took this term from Kiko Denzer's book on oven building. I measure temps with one of those gun type infrared thermometers. I sometimes see temps of 600 to 650 or more in the walls after the firing. 10 or so inches away thru the wall the temp of the exterior dome up high is 67 degrees. The adobe wall a few inches a way from the dome was 50 degrees which was about the outside temp that day. I used lots of vermiculite in the layer of cob surrounding the mostly clay sand core. There is about 5" of sand under the firebrick hearth and about 6 inches of just vermiculite with 5" of tamped, damp, cob mix to provide a more stable bed for the sand and hearth. There may still be pics in the photo area. I still haven't finished the outside. But it's under a roof at the back of our home. On the wheat I use: I have been misinformed about this and have been using hard red winter wheat. I just ordered a 50 lb. bag of it from our natural food coop. Hopefully going to a finer grind will help. The three rises is a good spot for correction as well. Thanks for that as well. Do you have pics of your oven posted in the photo area? On the firing time: I have been firing mine about 3 to 3.5 or 4 hours. I have mostly juniper and pinon here in central New Mexico. I know hard wood would give better heat. I have been extending my firing time over the last few baking cycles because I came to the same conclusion you mention, that a slower firing is better. I live in an adobe home which is based on the time delay of heat or cold moving thru it. I had asked Kiko about this but he never got back to me. So using the model of my adobe walls I started to fire longer to give the fire more time of heat up the mass. If I were going to build another oven I'd make the core section a little thicker. Also, I started using more of a wood called Algerita. It is a holly like plant with very sharp leaves and red berries. It is dense wood but smells bad in our wood stove so I was avoiding using it. It's also a bit toxic is you breath the saw dust when the sap is up. This worried me some too. But I reasoned since the wood is not burning during the baking cycle, it should be fine as a heat source. I think the herb barberry, a liver tonic, is the same as our local algerita. It has bright yellow sap wood surrounding a very dark almost ebony looking core. Its quite striking to saw thru the wood and see that stark contrast. The berrys are used in jelly making here locally. So I'm not too concerned about toxicity. It hasn't changed the flavor of the bread crust at all. I read in kiko's book to use wrist or maybe forearm sized wood and I made a firing door with large openings at the top and bottom also on Kiko's suggestion. Is yours a downdraft oven or did you give it a chimney? Mine is a down draft, built outside on a ledge. it's from Kiko's book using the 22 1/2" inner diameter. I live in Maine with about 5 acres of forest on my property so I have a lot of wood available. I do use some oak and maple, but spruce is plentiful and with the long firings I don't think hardwood makes much difference though I usually throw some in towards the end. Plus, spruce gets dead branches on it as it grows that are perfect diameter so I don't have to cut any live trees. The winters are pretty rough and I usually get a couple big spruce blown down. I've tried fir, larch and birch also. I have to cover up for the winter and want to build a bigger, enclosed one next year. I also have just about perfect clay on my property so plenty of materials. You place sounds great. I miss all the greenery from the east coast. But am well adjusted to south west living after 20 years or so. Branches are my big source of wood too. I am triming all the trees I can get to easily up above grass fire height so that generates lots of wood for the house and the oven. We are on 20 acres mostly wooded on top of a mesa in the middle of nowhere. The mesa top is about 300 acres and far from the power lines so we have no neighbers for quite a ways. The nearest town is 20 people and not growing much. We get lots of our heat from passive solar. Electrical sys. is solar too. I used to follow Laurel's advice, but, these days, thanks to Mike Avery's advice and instruction, I've just about stopped kneading altogether. Instead, I just do the stretch and fold. The dough development is at least as good as traditional kneading. Here's a link to an example of 100% whole grain (it's got rye and spelt, too) bread made using the stretch and fold. Now that's a revelation. I've seen some things on that but figured it was for white flour. I will try that next time to see how it goes. I will also try a batch with the flour you recomend if it's around here. I usually never buy flour because I just assume it's rancid or nearly so by the time I get it. I read years ago that as soon as wheat is ground, exposed to air, that an irevocable rancification process begins. I don't know if they put antioxidents in flour these days or not. Some of those are actually good for you. How long is the stretch and fold process to develope the gluten? I know that's kind of a hard question but a ballpark estimate is ok.
As far as whole wheat flour going rancid, I think it takes a while - a couple of months at room temperature, I'd imagine. Perhaps it does lose some nutrients starting after the first few days, but if you're getting high quality whole wheat flour, I'd not worry too much about it. Especially if you're just using it for a test. When I develop whole wheat sourdoughs, I mix everything together until it's fully hydrated and then let it sit (covered) for 1 hour. I then do a stretch and fold. I'll do two more at half hour intervals, so, after two hours total, the dough is fully developed. Of course, it's still got to do the first rise, but since sourdoughs usually aren't finished with the bulk rise before 3-4 hours at a minimum, that's not at all a problem. Hey JMonkey, I was reading thru your post on the wheat,spelt, rye S&F bread. On the starter and it's percent hydration...why do you use more if your starter is at 100%? Is that because there is less starter to water ratio? I really want to try this bread but don't have any spelt. Gotta say it again amazing looking whole grain bread. Do you think the spelt played any role in that awsome crumb? I don't know alot about spelt. Just that it's in my cereal. Ever try that organic cereal from Canada with spelt quinoa, and kamut? Its really good. One thing in your post caught me--the 98 degree oven for rising. One other possibility is that the dough is simply over-proofed, so there is no spring. Handling freeform loaves often causes them to deflate a little, and usually they spring back. But if you've over-proofed, you won't get much spring and they'll stay deflated. I am not a whole grain baker, but that does add a potential complication. In a white flour bread you would notice an off flavor from over-proofing--it might be described as boozy or overly yeasty. But if you are using freshly ground WW flour, that may have a strong enough flavor to mask it. I used to use very warm rises, but I find it makes the dough too volatile--the time between under- and over-proofed becomes very short, so it is harder to catch it at the right time. Maybe try a cooler (70-75F) rise? Thanks Scott, I'll definitely do that. I can open the oven door and take some readings till I get the temp down. I really appreciate everyone's help.